Our customers are in love with our promotional Crysta III range – it’s perfect for functions and events, and goes great presented in one of our gift boxes with a bottle of wine or good quality beer. With seven products in the range – the Beer Glass, the Footed Beer Glass, the Flute, the Saucer Champagne, the 160ml Wine, the 210ml Wine and the 260ml Wine – this range has something to suit everyone. Here at EzyMugs we know that finding stylish branded beer and wine glasses can be difficult – more often than not, you’ll find a great looking glass only to find out it doesn’t really hold a logo print well. The Crysta III range is completely different. These glasses have plenty of printing space, and they look great with a pad print. While the Crysta III range is a little more on the expensive end, the quality really shows with these glasses. The modern style is combined with a well-made glass ensuring your customers and clients get as much use as possible from the glassware. The Crysta 260ml wine glass is the perfect red wine glass, while the Crysta 160ml will suit either red or white wine. The Crysta 160ml is a good option for presenting with white wine and the Crysta Flute goes perfectly with a bottle of sparkling wine or champagne. Our Crysta Saucer Champagne glass is a popular choice with customers using it for either champagne or cocktails. 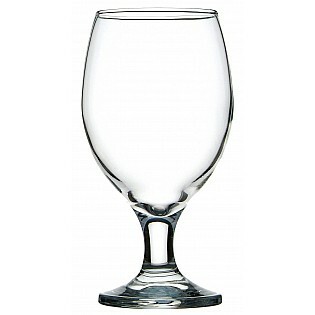 Moving onto our beer glass range, both the Beer Glass and the Footed Beer Glass look great. The Beer Glass is a more rounded style, making it perfect for weddings and functions, while the Footed Beer Glass will look great on any restaurant or bar table. When it comes to choosing a promotional beer glass or a branded wine glass for your next company gift baskets, a promo beer or wine glass to give to your customers to use in their business or to stock up for your function and events centre, the Crysta III range brings a touch of style that not many other glasses can.